Erica Arteseros is the Program Coordinator for the San Francisco Fire Department's Neighborhood Emergency Response Team (NERT). Capt. Arteseros joined the Fire Department in December 1997. Since her appointment in March 2004, Arteseros has supervised the training of over 16,900 people in NERT’s disaster preparedness and response classes. In addition, she has expanded the advanced training classes offered to NERT graduates so volunteers can maintain and increase their skill levels. Capt. Arteseros has also worked extensively with City agencies, the private sector, and individual citizens in pre-disaster planning and training. 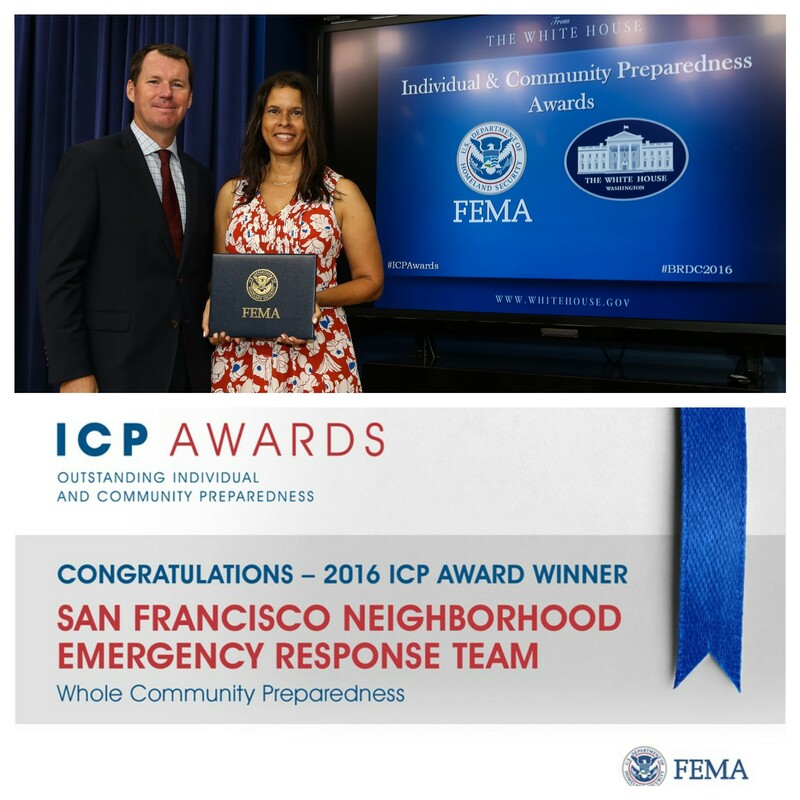 She has devoted particular effort to reaching under served areas in San Francisco to offer NERT's free disaster preparedness training. To reach more San Franciscans with personal preparedness information, Arteseros developed a two-hour personal readiness workshop that emphasizes the most crucial aspect of NERT training – how to take care of oneself. To ensure this has the greatest impact on the resiliency of the San Francisco community, NERT has partnered with San Francisco SAFE, Inc., working with organized Neighborhood Watch blocks in addition to individuals and families. In 2009, Capt. Arteseros became chair of the California Community Emergency Response Team (CERT) Workgroup, a group of CERT program coordinators throughout the state who meet quarterly to share best practices, to coordinate CERT needs with state representatives, and to ensure that the state’s CERT curriculum is current and consistent. She remains a member at large. In 2011, she received the award for Most Empowering City Employee from the Neighborhood Empowerment Network of San Francisco, an honor voted on by residents of San Francisco. She was honored to accept the FEMA John D. Solomon Individual & Community Preparedness award on behalf of NERT at the Whitehouse in Spetember 2016. A San Francisco native from the Western Addition, Arteseros attended Presentation High School and graduated from Humboldt State University. Capt. Arteseros lives in San Francisco. Gary joined the Board in 2012. NERT-trained in 2006, he serves as the Neighborhood Coordinator for South Beach NERT. He is also an ALERT volunteer for the SFPD. Born and raised in San Mateo, Gary was heading home from work at the time of the 1989 Loma Prieta quake and (true story) slept thru it! When not volunteering for NERT, Gary is the Secretary of his Neighborhood Association and works at his ‘real job’ as an Admin Assistant/Customer Service representative for a wholesale furniture company. Maxine joined the Board just before the turn-of-the century (the last one, not the 19th). She serves as Co-Coordinator for the Noe Valley NERT team and has done so since the late 1990's. When not hounding fellow San Franciscans to take NERT training or fellow Noe NERTs to attend advanced training, City-wide Drills and team meetings, Maxine heads for the hills to ski the steepest and deepest with her ski crew or to New York City to run the NYC Marathon. A proud retired Alameda County Public Defender attorney, Maxine is licensed to practice in California and several Federal District Courts. In addition to criminal law, Maxine has also practiced mind numbingly boring general business and bankruptcy law. Most recently, Maxine has worked as a criminal case consultant (defense side, of course) and as a legal consultant on a variety of cases and legal practice law areas. Lisa joined the Board in 2013. NERT-trained in 2010, she serves as the neighborhood coordinator for South of Market NERT. Born and raised in San Francisco's Inner Sunset, Lisa remembers being in the city the night following the 1989 Loma Prieta quake, watching the fires burn from the top of Twin Peaks. Outside of NERT, Lisa can be found biking, horseback riding and project managing construction projects for BCCI Construction. CCris completed NERT training in 2009, and is a California Disaster Corps volunteer since 2013. He joined the NERT Advisory Board in April 2014. Before moving to the Bay Area, he lived in New Mexico and New England, where disaster preparedness included keeping a candle and matches in the car. He enjoys time with friends, biking, skiing (not too fast), and traveling near and far. Rebecca joined the NERT Advisory Board in February, 2015. NERT-trained and a member of the Sunset/Parkside team since 2011, Rebecca enjoys meeting her neighbors in monthly meetings and drills where she practices her skills. When not volunteering for NERT, Rebecca is a Senior Operations Manager for a financial institution. In her spare time she enjoys music and dinner with friends. Linda joined the NERT Advisory Board in 2016. She moved from NJ to the Bay Area shortly before the 1989 Loma Prieta earthquake. After moving to San Francisco in 2010 she completed NERT training and then completed California Disaster Corps training in 2013. Linda also does volunteer work as an EMT and enjoys scuba diving, skiing and fire dancing. When not doing NERT things, Linda works as a Business Systems Analyst for a large biotech company. Born and raised in Milwaukee, Nathan moved to San Francisco in December of 2007. As a teenager Nathan was watching the Battle of The Bay in 1989 on TV and it left a lasting impression of life in earthquake country. While researching the liquefaction potential of various neighborhoods to call home, Nathan discovered a way to combine community involvement and resilience by completing his first NERT training in 2009. He is currently a co-coordinator for the NOPA neighborhood and really enjoys the opportunities to strengthen the skills of fellow NERT volunteers by teaching supplementary NERT classes.